First used as a stage coach stop on the way to Denver, the Glendale area has a rich history. Although it is only approximately one square mile in size, the City of Glendale is home to over 4,000 permanent residents. Nineteen different languages are spoken here. During the day, the population swells to over 40,000, with many people coming to Glendale to work, shop, and enjoy the recreational amenities the City has to offer. To serve this wonderfully diverse community, the Glendale Police Department strives to provide the highest level of police service. To achieve this, the Department embraces the best of both modern and traditional policing. Officers are furnished with state-of-the-art equipment and receive cutting edge training from honing their “verbal Judo” skills to classes for staying current with the rapidly-changing legal environment in Colorado to "Force Continuum" training. While the Glendale Police Department constantly reviews the latest developments in police science, the traditional value of community involvement is truly the cornerstone of policing in Glendale. We have recently created two C.L.O.U.D (Community Liaison Officer/Urban Development) positions in preparation for the needs of our new high-density 23-acre entertainment district Glendale 180. Every officer knows residents and business owners by name. Conversely, when seeking assistance from the Glendale Police Department, a citizen will quite often ask for a particular officer. Our officers strive to understand the needs of the citizens, so that the officers can provide the level of service that the citizens truly deserve. Their first question is often, "How can we help you succeed?" An island of Arapahoe County, Glendale’s approximately 365 acres are completely surrounded by the City and County of Denver. The City of Glendale Dispatch Center provides the critical link between the citizen that needs help and the police, fire, and EMT units that provide service for the City. The Dispatch Center was remodeled in August of 2012 and features state-of-the-art equipment. The Glendale Dispatch center is equipped with Enhanced 911 (E-911) capabilities, which allow the dispatcher to know the location of anyone calling 9-1-1 from a regular telephone. This is particularly helpful when victims are unable to speak and can only dial 9-1-1. The Glendale Dispatch Center is staffed 24 hours a day, every day of the week by one of six Communication Specialists or their supervisor Susan Collins. The unit handled 35,417 calls for service in 2017. Each Communication Specialist is trained to handle a wide variety of situations, ranging from emergency police calls, to building fires, to calls for medical assistance, to injury accidents. The Communication Specialists can also assist citizens by directing their questions to the appropriate officer or department within the city. In case of emergencies requiring immediate assistance by either police or fire personnel, citizens should dial 911. In non-emergency situations where an immediate response is not necessary, the public can dial 303-759-1511. The City of Glendale is located within the 18th Judicial District. This judicial district has developed protocols for the use of a multi-agency team designated to fully investigate the use of deadly force, typically through the discharge of a firearm by an officer(s), resulting in injury or death. 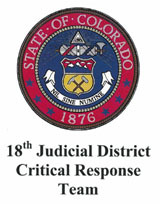 This team works at the direction of the Arapahoe County District Attorney’s Office and is typically comprised of members from participating law enforcement agencies, D.A.’s investigators, attorneys, and other specialized investigative agencies as appropriate, including Coroner’s offices and/or the Colorado Bureau of Investigation. Officer-involved use of deadly force will be investigated by the 18th Judicial District Incident Team. The Incident Team shall investigate the incident primarily to gather facts relative to the law. The team shall present fact-finding reports to the Chief of Police. The Department’s Internal Affairs Investigation shall investigate the incident with its primary focus being on policy and procedure. The Internal/Administrative investigation shall be subordinate to the investigation of the Incident Team.